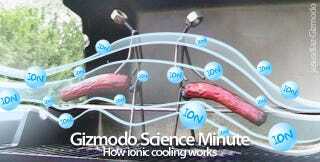 We first heard about ionic winds cooling down computers by 250% in 2007. Two years later, Tessera—a chip-packing company—has modified the technology so that it would fit into a working laptop. How ionic winds differ from typical cooling system is that by ionizing the air and passing it over a processor chip, the ionized air increased airflow on the surface, thus creating a cooling breeze over a hot microprocessor (as illustrated above).